Faliraki is like one big funfair, with a vast, multiethnic crowd tirelessly in pursuit of pleasure, day and night & in the morning, on the famous beach with its striped umbrellas, at night in the narrow streets with all their bars, clubs, cafes, fast food chains and restaurands. 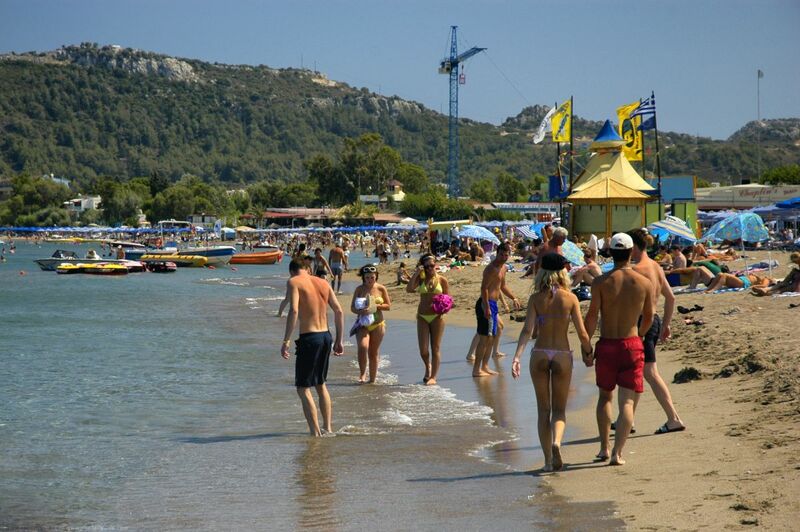 At the beach of Faliraki, visitors can find impressive golden sand, small rocks and pebbles. Different parts of the beach are very well organised with many trendy beach bars. Occasionally parts of the beach in front of certain hotels are reserved only for their guests. 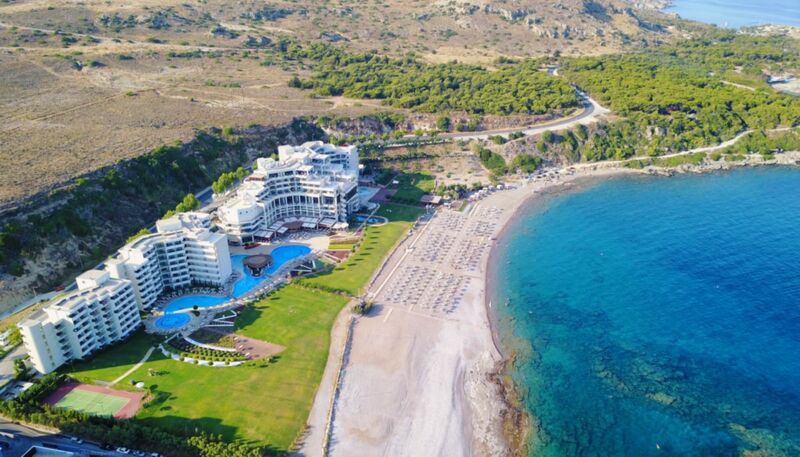 Water sports, cafeterias, night clubs, restaurants, bungee-jumping, places for shopping and more, Faliraki offers everything you can possible ask for. If you get hungry, you can choose from over 60 restaurants of different types, such as traditional Greek cuisine, Chinese food, international cuisine or Italian restaurants. At the impressive Faliraki Water Park, which is currently the biggest in Europe, you can enjoy water slides, a lazy river, black holes, rafting slides, the giant slide (about 140m long), kamikaze slides, a huge wave pool, an aqua-gym, poll-cafes and much, much more. A part of the water park is especially designed for children. 35 fully trained and certified lifeguards guarantee for your safety. 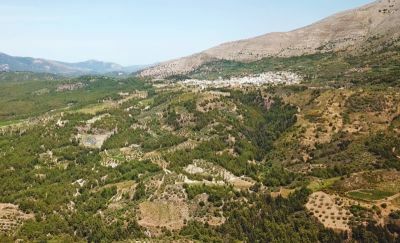 Local attractions include the archaeological site at Sarantapichos (near the village of Kalithies), which was probably part of an ancient acropolis. You can also visit the old monastery of the Prophet Amos on a hill just outside Faliraki. It's like a cross between a ghost town and the wild west. A total nightmare if you are looking for the real culture of Greece. nast bars , grim. 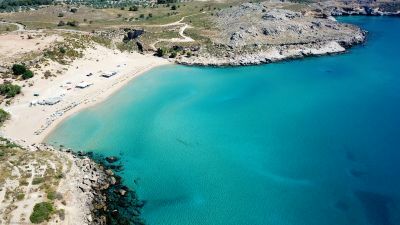 Going to faliraki end of August and looking forward to stay there for an week! I wonder if it is nice to bike there and if the traffic is nice to the bikers? Sombody knows something about that? We are off to Faliraki AGAIN end of August, it will be our 11th time. First went in 2000, it was full on in those days never saw any trouble we were in & bar street everynite / morning. People so friendly, beaches beautiful some lovely restaurants to be found, just ask locals to direct you to Manolis or Kabos. 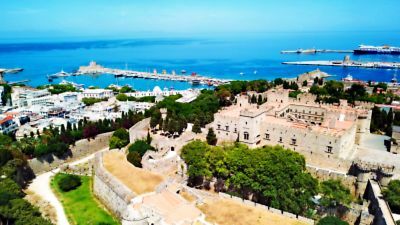 Get the boat to Rhodes town, well worth a visit! Go along to bar Bliss ln club street. Nicos & Yiota will make you very welcome best cocktails on the island. We are not young but Faliraki has something for everyone even a funfair!! forgot to mention the Orion restaurant great food lovely family run place great value for money. So give Faliraki a try. You wont be disappointed, and you will certainly will be made very welcome by the wonderful Greeks. THE BEST ever holidays I had with the family!! I recommend it for relaxing family holidays!! BEST beaches on the island! Combines everything you want!!! was an amazin holiday best eva! everyone was dead friendly none trouble in fact im thinking of goin to work there this summer it was so good. Hi im looking for people I met in faliraki july 05. was the best experience of my life and ended up workin out there was gunna work the season but I went home and found out I was pregnant! I wish I could afford 2 live there it is the most amaz in the world! something 4 everyone and u can never get bored there! Love it! I'm coming to Faliraki in June. Many of my friends were there before and said it was great for their first holiday. Me and my friends are excited and espically as it's out first girl holiday. The write up's have made us even more excited I just hope it all goes well. Hiya! 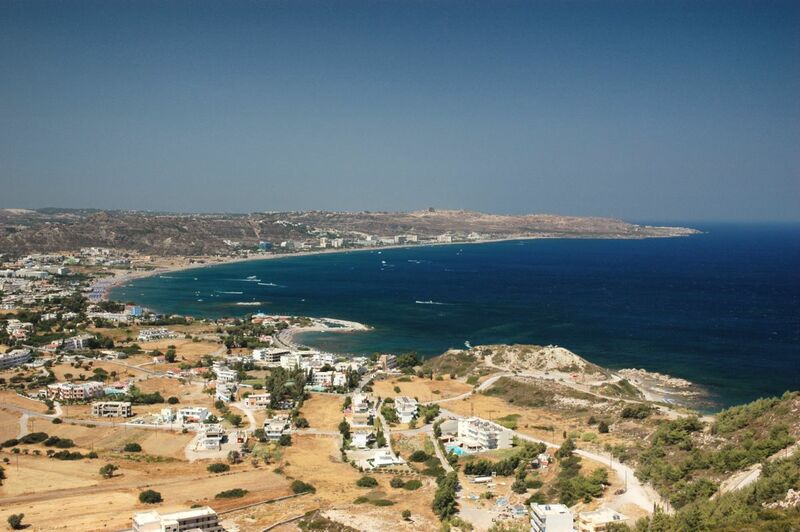 Im going to Falaraki on September 5th for a week with a couple of my mates! I cant wait but im worried it might be a bit out of season, will it still be busy? warm? and will the clubs be open? or will I be playing Bingo. Could someone let me know please! Thanks! Got back from Faliraki 2 days ago n im missin it. The night life is intence n i luved every second of it in deff goin back next year all the gory storys are untrue I didnt see 1 scrap of trouble while on a night out and I was out clubbing 80 percent of the holiday. This is our first Europe holiday as normally go furtrher afield. We will definitely be coming back next year. What a fantastic experience. Please do not listen to the stories, come and try for yourself. The beaches are beautiful and clean. Losts of places to eat even McDonalds if you like that. If you want greek restuarants you have to ask the locals who are very helpful and will lead you in the right directions. It is very safe to venture out by yourself. My holiday was worth every penny. Me and three of my friends went to faliraki in july 06, it was the best hols ever, we are going back next year. 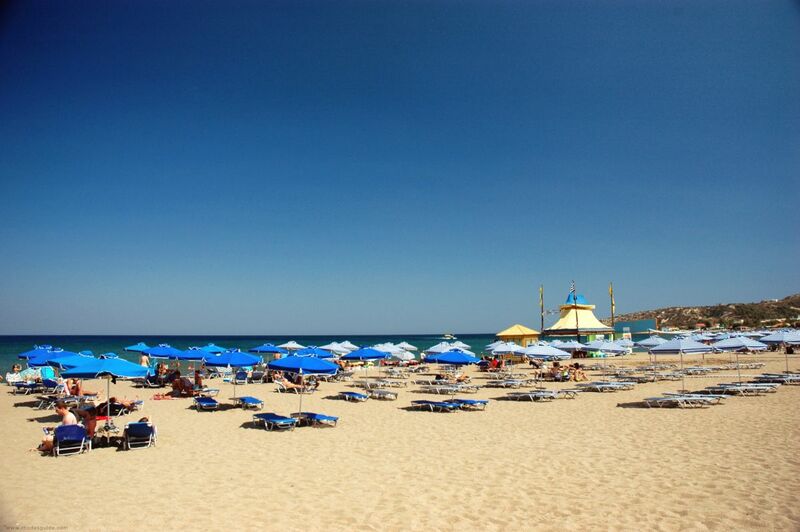 The beach and water sports are great and it doesnt cost that much for the activities. The night life is great, the best club to go to is Q club the staff are great and are really friendly. We where are sad about having to come home. Well recommended ignore any horror storys you hear they are rubbish. I went to faliraki last september and it was fantastic best holiday eva!!! I was worried at first but as soon as i got there that worry went so many gorgeus friendly fellas! everyone helps I love it just booked 2 go again this year!!! cant wait!! Ee went to faliraki in summer 2003 for staceys b.day it was the best holiday of our lives ! its absoloutley brill there !!! Been going to Rhodes for 8 years and as always Faliraki is good fun..
Me and my mate were in faliraki in July 04 and had the best time ever. The clubs were the best and met so many really nice people. would diffently go back. Me and my girlfriend had a fantastic stay in Rodos and Faliraki in summer 2003. It was great and we would love to come again. The water park was fantastic! You should visit it. This place has a crazy nightlife! It is probably the best spot on the island if you intend to get wild in the nights. We loved every minute in Faliraki. Only problem was the crowds, but thats also what makes the place so intense. I was in Faliraki last year. I had a fantastic time, went on my own and had no problems, people there were very friendly! Visit the water park, it is great!